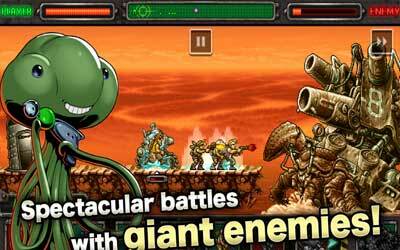 Metal Slug Defense 1.25.1 APK is available in my archive. The latest version gives you new areas, new missions, new units and new languages. This is about the items so it’s better to update it to get it all. This game has a 2D view, but there are many differences Game Play the fame on Android compared with PlayStation and PC versions. In android version we did not play as a character but as a strategist. We are given points which named the AP, these points we use to recruit soldiers in accordance with its value, and every soldier has the capability respectively. Really fun game. It takes a bit of grinding to upgrade units, but it’s worth it. Also, for those of you who “lost” your save files on the cloud, you have to press the button when the game starts up a second time. Then, you find your save file and load it up.